Do businesses understand what customer experience teams do? Customer experience has an identity crisis. But CX teams should explain their role in the organisation as eight distinct parts. This was the remark I received from a colleague at a previous organisation. A remark most customer experience professionals will have heard many times before. 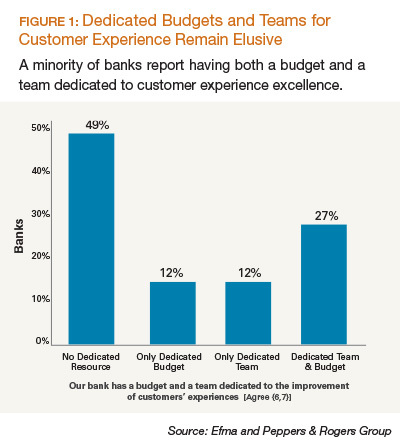 Customer experience teams increasingly face an identity problem. People hear it mentioned and often think CX is something fluffy, or something that’s isolated: an extension of the call centre, or solely about designing journey maps or pretty online interfaces. Others think it’s just measurement; some think it’s about single-mindedly doing what customers want; but very few talk about customer experience as a contribution to the overall performance of the organisation. According to recent research by Forrester, around the globe, very few brands offer a standout experience that's good enough to create a large and sustainable advantage over current competitors, let alone safeguard against future disruption. Given how many businesses are starting to build CX teams, how much money is being spent on it, and how important it is to so many organisations, you would expect the discussion about customer experience teams to be evolving beyond the wholly narrow views mentioned above. When I started considering this some time ago, I found there is a chasm between the huge amount of time we devote to selling the tools and the ideas versus the time we devote to explaining what a customer experience team does. There are endless theories and magic pills from consultants and product vendors that propose they have the answer if you’re willing to pay a bucket load; there’s also many maturity models that talk to prescriptive tools, tasks or activities you should be carrying out as an organisation to positively influence the customer experience. But how does a customer experience team ensure it is holistically making a difference, and that people in its own organisation understand its purpose? If a business doesn't have clarity about the customer experience function, then your efforts to positively influence the experience of your customers is left to chance and subject to the strongest internal voices and whatever demands people within the organisation care to invent, spend on and call “customer experience transformation”. They find and create understanding of performance and customers. They influence change in performance. Gathering data, information and knowledge: Lack of information means you’re operating purely on opinions and often leads to suspicion, distrust, unwarranted criticism and sometimes even change in focus or reductions in authority or spending. Acquiring knowledge is not just a matter of doing more research, installing a better text analytics tool or spending a bucket load on new technology; you need to do more than simply evaluating objective data. Getting variety in your data means your team won’t miss critical information that could be the difference between success and failure. Implementing improvements: Customer Experience puts the focus on change, it needs spirit of wanting to be better and it needs you to actually make changes real. Having a variety of data inputs means nothing if you're not implementing and letting customers know their voices are being heard. Generating and sharing insights: Insight is difficult to identify, easy to deny, clear as day once the disruption has happened and it’s too late. Even with great data and tools, insights can be exceptionally tough to find and share. It is an entirely different beast to raw data or information, it’s the hidden truth. In the organisation it is the sense-making and sense-giving that results from digging. Insights are by definition actionable and can help your organisation make more informed decisions, design and deliver more successful outcomes, and create mutual value. Help you to understand, to see patterns. Encourage people to improve performance. Show you the extent of variation in your performance. Show the relationship between the stuff you do, and the outcomes you’re driving for. maintain a clear focus on what is manageable and achievable within available resources. review the contribution and impact of individual projects and appraise what can make a difference. align activity with wider organisational objectives and priorities. ask questions about what has occurred. put a focus on ensuring baselines exist to enable judgements to be made about progress over time. Identifying risks and/or looking for alternative ways: The biggest enemy to change is complacency, becoming satisfied with your current results and unaware of how and what might be eroding performance. Working with the business to connect to what’s going on internally and externally means teams can adjust, challenge myths and respond with agility. Recommending and advising: Insights and tools don’t design or improve products and services on their own, people do and that requires influence. Delivering an improved Customer Experience requires processes to change, different people, technology, and skills. More specifically you’ll need to connect with people who have deep specialist knowledge inside the organisation and possibly influence them to make change. A strong Customer Experience team with patience, knowledge, expertise, and influence will be necessary to achieve the outcomes of differentiation. There’s no two ways about it, it’s hard but it can be done. This is my take on things. Do fellow customer experience professionals agree? Lead a function that's all about the customer and business performance. Provide hands on support to the business and act as a change agent. My team is always looking to explore and understand the richness and complexity of human behaviour by studying it from more than one standpoint. I feel it's a very well articulated description of CX teams' functions, thank you. In many organisations CX teams face redundancies and budget cuts now because they are not strong enough in articulating their purpose and more importantly easy to distract from it to deliver 'quick wins'. I think this is an excellent framework but it could do with a little more weighting in certain areas. Isn't the reality that most of the time your team spends is committed to gathering data and knowledge, for instance? Also, it isn't clear how much time is committed to working with teams outside customer experience? I.e. ops or sales.